1. What’s the difference between the Belgian Quadrupel (Quad) and the Belgian Dark Strong Ale (BDSA) beer styles? Is there even a difference at all? 2. Is the Belgian Quad style simply a sub-style of Belgian Dark Strong Ale? 3. What’s the difference between a Trappist beer and an Abbey beer? 4. Is a Belgian Quad four times stronger than a Belgian Enkel (Single)? 5. Where did the terms Belgian Quad, Tripel, Dubbel and Enkel come from and why are they named the way that they are? 6. What are the descriptions of a Belgian Quad and a Belgian Dark Strong Ale? The difference between a Belgian Quad and a Belgian Dark Strong Ale can be a bit of a tricky subject. Of course the more accurate answer as to the difference between a Belgian Quad and a BDSA is that it depends on who you ask. But it’s really not as simple as saying that a “Belgian Quad” is just a stronger (more alcoholic) version of a Belgian Dark Strong Ale because looking at the BA’s Beer Style Guidelines (the organization that draws a distinction between the two beer styles), you can have a BDSA at 11.2% ABV, and a Belgian Quad at 9.1%. Using only the BA Guidelines, at best we could say that a Belgian Quad may be stronger than the strongest BDSA because, according to the BA’s Guidelines, a BDSA is max 11.2% ABV whereas a Quad’s max ABV is 14.2%. We could also say that what the BA Guidelines consider a Belgian Quad could more or less be at the upper ABV range of what the 2015 BJCP Beer Style Guidelines consider a BDSA, although the max ABV for a BDSA per the BJCP is 12%, which is a bit below the BA’s maximum 14.2% ABV Quad limit. And it’s in this sense that a Belgian Quad could be considered the most alcoholic version of a Belgian Dark Strong Ale (BDSA). Perhaps this is what some people mean when they say that the Belgian Quad style is simply a sub-style within the Belgian Dark Strong Ale style. Though to be clear , it is certainly not the case that the BJCP description of Belgian Dark Strong Ale completely encompasses the BA description of Belgian Quad, let alone the BA description of Belgian Dark Strong Ale. Not even the BA’s description of Quad is contained within the range of its own description of a BDSA. In other words, if we take the BA’s guidelines at face value, a Belgian Quad as described by the BA could not be a sub-style contained completely within either the BA’s or BJCP’s description of the BDSA style. 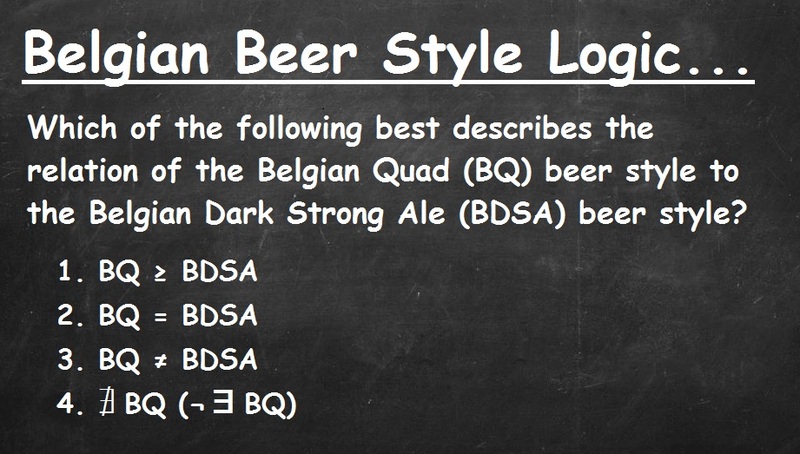 So in that technical sense, a Belgian Quad is not a sub-style within the BDSA style. Strict definitions aside, it’s hard to have a discussion about Belgian Quad or Belgian Dark Strong Ale without talking about their history and their relation to their Trappist cousins. So to give a bit of context, some classifications systems list Belgian Quads as the strongest in the continuum of Trappist (or abbey) ales arranged by ascending alcohol content. In order, these include Enkel (Single), Dubbel (Double), Tripel (Triple), and the Quadrupel (Quadruple). Abbey beers, on the other hand, “are beers produced in the styles made famous by Belgian Trappist monks, but not actually brewed within the walls of a monastery.” The need to make a distinction between Trappist and Abbey beers was due to the fact that non-Trappist brewers who may or may not have had any connection to actual Trappist brewers were attempting to profit by using the name “Trappist” and the good reputation that authentic Trappist brewers had earned for producing quality beer. Today, there are eleven monasteries producing Trappist beer including six in Belgium (Orval, Chimay, Westvleteren, Rochefort, Westmalle and Achel), two in the Netherlands (Koningshoeven and Maria Toevlucht), one in Austria (Stift Engelszell), one in Italy (Tre Fontane Abbey), and one it the United States (St. Joseph’s Abbey). To be clear, the terms Dubbel, Tripel, and Quad refer to the relative strength of the beers in question, and are not double, triple or quadruple the alcoholic strength of an Enkel (Single), respectively. Economics may have played a part in the origin of the terms Enkel (Single) and Dubbel (Double). For example, Stan Hieronymus writes that “as far back as the sixteenth century, brewers learned that they could charge more for strong beer, considerably more than the additional ingredients and labor would cost. Dubbele clauwaert was introduced in 1573, and quickly supplanted enekle clauwaert as the best-selling beer”. Hieronymus seems to suggest that dubbele clauwaert was brewed from “first runnings” and enekle clauwaert was produced from “second runnings”. First and second runnings are brewing terms related to an old brewing technique called parti-gyle brewing where multiple beers of different alcoholic strength could be made from the same batch of malt. You might compare parti-gyle brewing to using the same tea bag to make subsequently weaker cups of tea. For example, the first step of parti-gyle brewing is to mash a batch of malt (mashing is the process by which malt is soaked in hot water for about an hour in order to convert the starches in the malt into fermentable sugars). The resulting sugary liquid is called wort. The first runnings is the most sugar-concentrated wort which is drained off and transferred into a separate vessel, leaving the malt behind. Second runnings is the result of the same batch of malt being sparged (rinsed with hot water), which yields a less sugary wort and therefore produces a weaker beer. Third runnings would be a third even less sugary wort produced by sparging the same malt, once again resulting in an even weaker beer, and so on. In his blog, Christopher Barnes notes that the MBAA (Master Brewers Association of the Americas) theorizes that the parti-gyle system of brewing could be the origin of the names of Enkel, Duppel, and possibly Tripel as the sugar content of the first runnings would be about 22.5%, second runnings about 15%, and third runnings 7.5%. This results in the Dubbel having two times the sugar content as the Enkel (Single), and the Tripel having three times the amount of sugar as the Enkel (Single). Of course, when it comes to discussing Belgian beer styles, it’s important to remember that the concept of grouping beer into categories called “beer styles” is relatively new, originating with Michael Jackson’s 1977 book The World Guide to Beer. In 1977, Jackson did not refer to the “Belgian Quad” or “Belgian Dark Strong Ale” beer styles by name at all, but he did identify “Trappiste” beer as a style that contains within its range a few sub-groups which of course included the golden-colored “Triple” style. In Jackson’s defense, it wasn’t until 1991 that the very first so-called “Quadrupel” was produced by La Trapp (Koningshoeven brewery), although Jackson does mention St Sixtus, noting that the brewery “has a selection of excellent dark ales, ranging in alcoholic content from four to twelve percent by volume.” The twelve percent beer would, by some modern classifications, be considered a “Quad”. Jackson also includes a photo of a bottle of Trappistes Rochefort 10 (11.3% ABV), which was developed in the late 1940s and early 50s, and is also today classified by some as a Quad. Hieronymus had next to nothing to say about “Belgian Quads” aside from a small line in his 2005 book Brew Like a Monk referring to the “quadrupel” style that’s “not quite a style.” And like Strong, Hieronymus also lumps beers some consider to be Quads under the category of Belgian dark strong ale. 1. Trappist: drier, lower final gravity, with examples being Westvleteren 12, Rochefort 10, and Chimay Grand Reserve [blue]. 2. Abbey: fuller body, sweeter with examples being St. Bernardus Aby 12, Gouden Carolus Grand Cru, Abbaye des Rocs Grand Cru, and Gulden Draak. 3. Barelywine: mostly malt with examples being Scaldis (Bush), Weyerbacher QUAD, and La Trappe Quadrupel. 4. Spiced: N’ice Chouffe and Affligem Noël. Belgian-Style Dark Strong Ale: Belgian-Style Dark Strong Ales are medium-amber to very dark. Chill haze is allowable at cold temperatures. Medium to high malt aroma and complex fruity aromas are distinctive. Very little or no diacetyl aroma should be perceived. Hop aroma is low to medium. Medium to high malt intensity can be rich, creamy, and sweet. Fruity complexity along with soft roasted malt flavor adds distinct character. Hop flavor is low to medium. Hop bitterness is low to medium. These beers are often, though not always, brewed with dark Belgian “candy” sugar. Very little or no diacetyl flavor should be perceived. Herbs and spices are sometimes used to delicately flavor these strong ales. Low levels of phenolic spiciness from yeast byproducts may also be perceived. Body is medium to full. These beers can be well attenuated, with an alcohol strength which is often deceiving to the senses. Belgian-Style Quadrupel: Belgian-Style Quadrupels are amber to dark brown. Chill haze is acceptable at low serving temperatures. A mousse-like dense, sometimes amber head will top off a properly poured and served quad. Complex fruity aromas reminiscent of raisins, dates, figs, grapes and/or plums emerge, often accompanied with a hint of winy character. Hop aroma not perceived to very low. Caramel, dark sugar and malty sweet flavors and aromas can be intense, not cloying, while complementing fruitiness. Hop flavor not perceived to very low. Hop bitterness is low to low-medium. Perception of alcohol can be extreme. Complex fruity flavors reminiscent of raisins, dates, figs, grapes and/or plums emerge, often accompanied with a hint of winy character. Perception of alcohol can be extreme. Clove-like phenolic flavor and aroma should not be evident. Diacetyl and DMS should not be perceived. Body is full with creamy mouthfeel. Quadrupels are well attenuated and are characterized by the immense presence of alcohol and balanced flavor, bitterness and aromas. They are well balanced with savoring/sipping drinkability. Oxidative character if evident in aged examples should be mild and pleasant. Belgian Dark Strong Ale: Overall impression: A dark, complex, very strong Belgian ale with a delicious blend of malt richness, dark fruit flavors, and spicy elements. Complex, rich, smooth and dangerous. Aroma: Complex, with a rich-sweet malty presence, significant esters and alcohol, and an optional light to moderate spiciness. The malt is rich and strong, and can have a deep bready-toasty quality often with a deep caramel complexity. The fruity esters are strong to moderately low, and can contain raisin, plum, dried cherry, fig or prune notes. Spicy phenols may be present, but usually have a peppery quality not clove-like; light vanilla is possible. Alcohols are soft, spicy, perfumy and/or rose-like, and are low to moderate in intensity. Hops are not usually present (but a very low spicy, floral, or herbal hop aroma is acceptable). No dark/roast malt aroma. No hot alcohols or solventy aromas. Appearance: Deep amber to deep coppery-brown in color (dark in this context implies more deeply colored than golden). Huge, dense, moussy, persistent cream- to light tancolored head. Can be clear to somewhat hazy. Flavor: Similar to aroma (same malt, ester, phenol, alcohol, and hop comments apply to flavor as well). Moderately malty-rich on the palate, which can have a sweet impression if bitterness is low. Usually moderately dry to dry finish, although may be up to moderately sweet. Medium-low to moderate bitterness; alcohol provides some of the balance to the malt. Generally malty-rich balance, but can be fairly even with bitterness. The complex and varied flavors should blend smoothly and harmoniously. The finish should not be heavy or syrupy. Mouthfeel: High carbonation but not sharp. Smooth but noticeable alcohol warmth. Body can range from medium-light to medium-full and creamy. Most are medium-bodied. So should “Belgian Quad” be considered as a unique beer style on its own, or is it really just another name for a Belgian Dark Strong Ale? 1. Oliver, Garrett. The Oxford Companion to Beer. New York: Oxford UP, 2012. 1, 3, 796. Print. 2. Hieronymus, Stan. Brew like a Monk: Trappist, Abbey, and Strong Belgian Ales and How to Brew Them. Boulder, CO: Brewers Publications, 2005. 37, 138, 202-03. Print. 3. Protz, Roger. “Beer Made by God’s Hand.” All About Beer Nov. 2010: 48-49. Print. 4. Mosher, Randy. Tasting Beer: An Insider’s Guide to the World’s Greatest Drink. North Adams, MA: Storey Pub., 2009. Print. Hi, I’m Dan: Beer Editor for BeerSyndicate.com, Beer and Drinking Writer, BJCP Beer Judge, Gold Medal-Winning Homebrewer, Beer Reviewer, AHA Member, Beer Traveler, and Shameless Beer Promoter. If they’re not already, both The Stoic and Not The Stoic should be two of your bucket list beers. Of course the question naturally arises, which of these two exceptional brews is better: The Stoic or Not The Stoic? Well, as it turns out, the answer is both. Both beers are classified by the brewery as Belgian Quads (more about the “Belgian Quad” beer style below). But as their names suggest, The Stoic and Not The Stoic are ABSOLUTELY NOT the same thing. One clearly zeros in on what many refer to as the Belgian Quad style (think St. Bernardus Abt or Westvleteren 12). The other is amazingly complex, but is probably better described as a Belgian Golden Strong ale with a Saison nose. In other words, one brew was objectively better at reppin’ the so-called Belgian Quad beer style and projecting those common dark raisin, date, prune notes, while the other scored higher in subjective personal enjoyment. The upshot? Each beer is better than the other, and it seems “taste” is both objective and subjective. Prior to its 2011 release, The Stoic spent five years as an experimental beer, until finally becoming an official member of Deschutes’ coveted “Reserve Series”. The Reserve Series are self-described small batches of audacious, experimental, outrageously coddled beers which as of this writing include Pinot Suave, Black Butte XXVIII, The Dissident and The Abyss. ABV is 10.9%, 20 IBUs and aged 11 months in Pinot Noir barrels (16.5%) and Rye Whiskey barrels (16.5%). 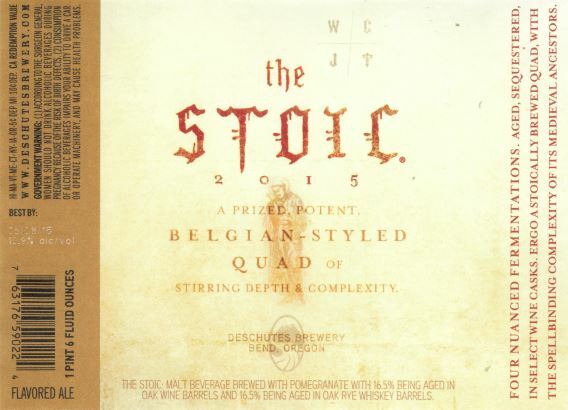 Our Tasting Notes on 1/25/16: Overall, The Stoic seemed less like a typical Belgian Quad, and more like a Belgian Golden Strong Ale with a Saison nose. Appearance: Pours a slightly hazy copper brown (13-14 SRM), generating about a finger of light tan head which retreats almost completely within 20 seconds. Aroma: Belgian Wit yeast, spicy Saison notes, pears, unripe plum, a hint of apricot, light coriander, a bit of angel food cake, a hint of pith and nicely perfumy. Flavor: Unbelievably complex and on the sweet side, bready, rich, the 12.1% alcohol is well-masked, light grapefruit, straw, stewed pears, light apple sauce, Belgian candi sugar, yeast, flower nectar, and slight Juicy Fruit, a hint of hay balanced by a citrusy funk, somewhat sour acidity, mild Chardonnay, slight salinity, and finishes nearly dry. Full-bodied and warming, but not boozy. Misses any of the raisin, plum, dried cherry, fig or prune notes one might expect in a typical Belgian Quad or Belgian Dark Strong Ale. 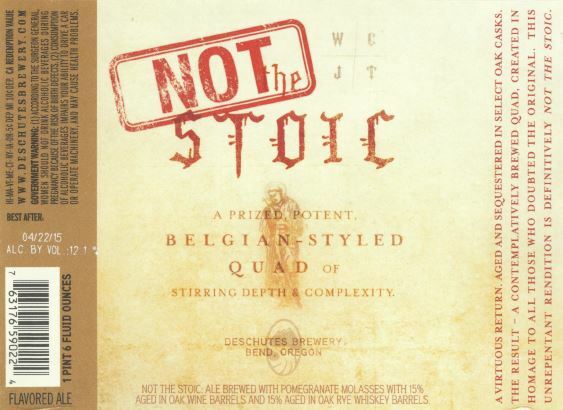 Not the Stoic weighs in at a formidable 12.1% ABV and is brewed with one hop (Czech Saaz), and three malts including Pilsner, Special B, and Crystal Rye. 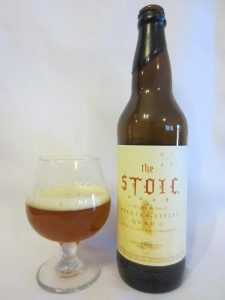 At only 15 IBUs, Not the Stoic is barrel-aged for 11 months in Pinot Noir barrels (15%) and oak Rye Whiskey barrels (15%). Our Tasting Notes: Balanced, complex and rich, Not the Stoic decants a nearly clear garnet brown body (16 SRM), with a quickly fading quarter inch of dark tan head. Aroma: Raisin toast, Disaronno, candied cherries, faint pomegranate, prunes, dark wheat bread, toasted marshmallow, burnt molasses, dried red fruit, borderline Maggi seasoning sauce (umami), hint of oak, Lincoln logs, mulch and a nip of alcohol as it warms. Flavor: Malty, caramel, molasses, some wood barrel, saké, Disaronno, leather, balanced by a tannic woody bitterness, leaving behind a bit of booze in the aftertaste. Full-bodied and warming with medium carbonation. 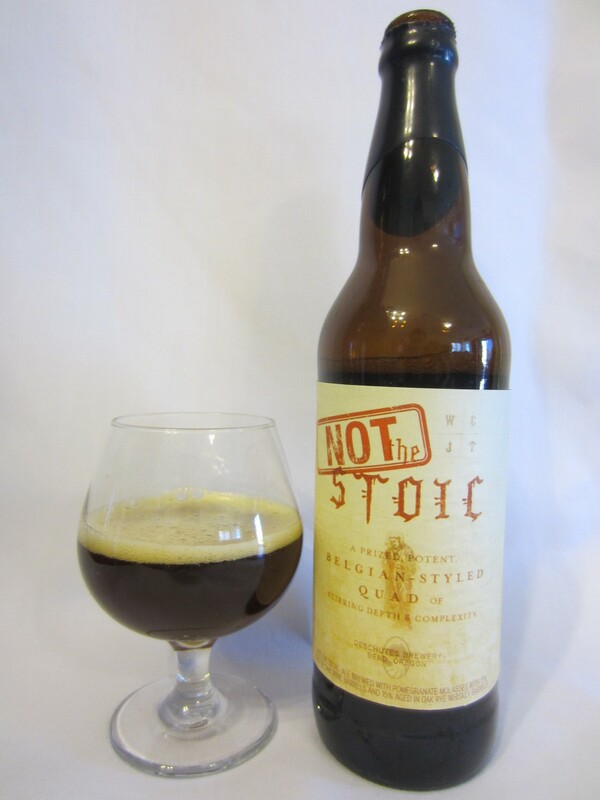 As mentioned, The Stoic is a self-described Quad alluding to the style’s alcoholic oomph, but of course “quad” also means “four”, and certainly we see the number four crop up a few times with this beer. For example, ever wonder what those four mysterious letters “WCJT” stand for on the labels of both The Stoic and Not The Stoic? No, they’re not the brewer’s initials, but rather “WCJT” stands for the four cardinal virtues of the Stoic philosophy which were derived from Plato: wisdom, courage, justice, and temperance. These four virtues are also sometimes translated as prudence, fortitude, fairness and moderation/restraint, respectively. According to the brewery, the four virtues used to brew The Stoic however were compelling ingredients, nuanced flavor, sound body, and a composed harmony. Or what about the quaternate makeup of The Stoic: one malt, three hops. Even Not The Stoic follows a similar numeric pattern (three malts, one hop). Likely an odd coincidence, but what about “2011” (2+0+1+1), the year The Stoic was originally released? Less coincidental, how about that this beer undergoes four nuanced fermentations? What is Stoicism? It’s the philosophy which began around 300 BC in Athens that held, among other things, that destructive emotions are a result of errors in judgment and that such emotions including anger, envy, lust, and jealousy could be overcome by the development of self-control and fortitude. Although Stoic ethics espoused freedom from suffering by following reason and logic, the Stoics did not purport to eliminate emotions, but to change them by following a stern abstention from worldly pleasures in order to obtain clear, objective judgment and inner calm. 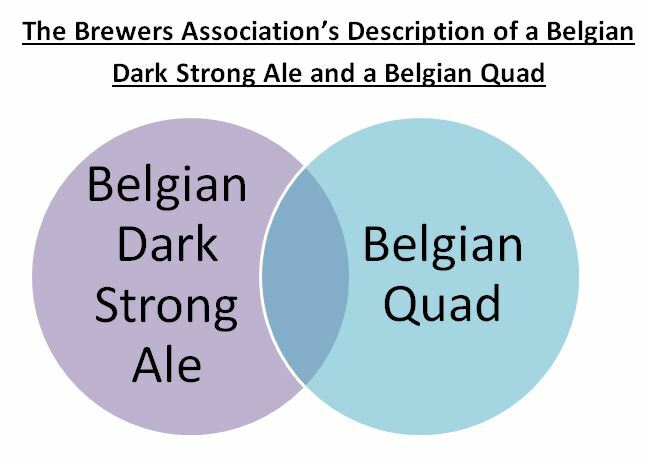 Related Article: What’s the Difference between a Belgian Quad and a Belgian Dark Strong Ale (BDSA)? Most of the beer drinking world is familiar with German Pilsener, or “Pils” as it’s commonly referred to in Germany. And whether we’re talking about Warsteiner, Bitburger, St. Pauli Girl, Radeberger, König Pilsener, Paulaner Premium Pils, or any other popular Pils from any of the well-known German breweries, all good examples of German Pilseners have something in common. They’re light-bodied, gold-colored— usually with excellent clarity— crisp, clean, well-carbonated and finish dry. The best examples exhibit a lightly grainy-sweet malt character which is never dominated by big bold hops. Sure, hops are there, but they’re primarily used for their bittering properties and not to showcase any of the intense citrusy, piney, tropical fruit, grapefruit notes you often find in some hopped-up American brews. And while German Pils may not be the most exciting of beer styles, it’s hard not to appreciate the refreshing and delicate balance of a very well-crafted example. Of course you don’t have to be located in Germany in order to brew a world-class German-style Pils. In fact, some of the world’s best Pils (such as Trumer Pils of Austria) are brewed outside of Germany, so it was only a matter of time until a growing number of American craft brewers jumped into the game. For this beer review, a panel of predominately BJCP beer judges take a quick look at some of the German-style Pilseners brewed in the good ol’ U.S. of A. to see how ‘Merican craft brewers fare at brewing this bitter, but refreshingly modest German classic. And while we love a good Czech Pilsner or even an avant-garde interpretation of a classic beer style, what we’re searching for here is a beer that’s clearly identifiable as a traditional German-style Pils. We’re looking for a beer that if you closed your eyes and simply smelled and tasted it, there’d be little doubt that you’re drinking a German-style Pilsener. We also humbly acknowledge that this list is further limited due to the highly regional nature of beer distribution. 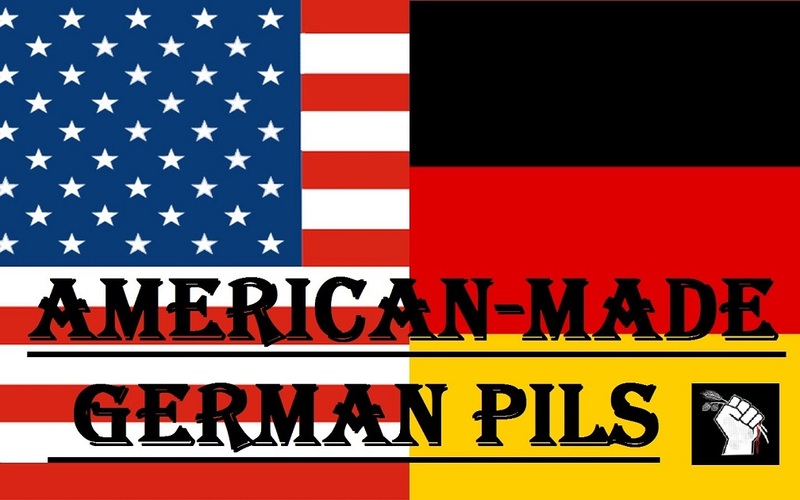 In short, this is simply a list of 20 American-made German Pils we could get our hands on, not EVERY American-made German Pils on the market. Lastly, just because a beer didn’t rank very high, doesn’t mean it was bad. In fact # 20 was quite enjoyable, but just wasn’t terribly representative of a traditional German Pils. And the competition was fierce, with many beers differing by less than half a point out of 100 after scores were averaged.